Are you having concerns about installing your hardware? Nob Hill can put you in touch, through Floyd Total Security, with some of the best craftsmen for installing hardware correctly. We will also key those locks to one key for maximum convenience, or to a special key fitting only certain doors. We specialize in Medeco High Security locking cylinders. These cylinders fit inside most existing hardware. This adds the best in design to the best in key control. Medeco locking cylinders, through a US patent, allow for only authorized persons to get the keys reproduced. Nob Hill also offers a selection of digital and push button locks. These locks provide the convenience of no keys with the ability to easily change the combination. Nob Hill is an agent of security systems designed, installed, and monitored by Floyd Total Security. Floyd can provide estimates for monitored security and fire alarm systems for your home. Nob Hill clients receive discounted pricing as a thank you for your business. Floyd Alarm Systems are easy to use, competitively priced, and locally monitored at our own UL Central Monitoring Station. After installation, a certificate is provided for your insurance company. Our burglary and fire systems qualify for discounts on your home. Having a safe in the home should be part of your overall security plan. Safes provide protection for important papers, jewelry, and other valuables from fire and burglary. Safes at home provide convenience as you always have the papers, jewelry and other valuables secure and right at your fingertips. Even with the best security alarm system, police response can vary. A squad could be right down the street or attending to a robbery or serious auto accident. In any of those cases, there will be some period of time between 5 and 30 minutes for the officers to arrive at your home. During that time you need a barrier inside the home to keep the thieves out. Safes in the home do just that. In the case of a fire, our safes provide fire protection for your valuables by keeping the inside temperature below 350 degrees. At Nob Hill we sell only the best quality safes. Hopefully, the safe will never go through a fire or be attacked by thieves. However, if it does, you need to be sure your valuables are protected. Our CSC model safes are designed to protect against a burglary attack as well as providing 1-2 hour fire protection. Our CSC safes come in many sizes and are heavy enough so they cannot be easily removed from the home. Combinations are digital, very easy to use and changeable by the homeowner. 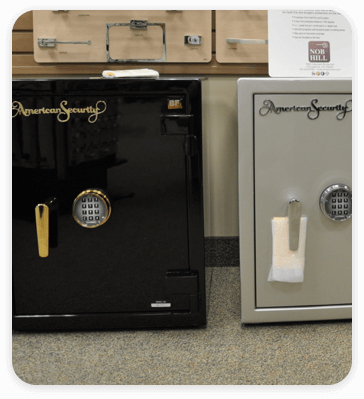 While at Nob Hill, check out our CSC safes and other models for the right home safe to fit your needs.